From entering this detached family home it is obvious what scale and quality of home is on offer. From the large sweeping driveway and garden to the front you are welcomed by an open and bright hallway with timber flooring and access to the living areas and bedrooms. The split level layout affords this home some stunning and individual features such as the raised living space with balcony boasting far reaching views which is accessed via a vaulted stairwell with tones of mastery and opulence. The lower level has been transformed into a open plan family area with large dining area and modern fitted kitchen which effortlessly leads into the garden space. On the main level there are four bedrooms, with a large family bath and shower room, and downstairs offers a WC and utility room. Outside this property has enclosed, and Southerly gardens which have been lovingly cared for by the current owners making use of the size and levelness. A pathway leads around the side of the property with ones side currently housing a further secluded area put to use currently as a hot tub and relaxation area. There is a garage with electric roller door and a drive with parking for at least three to four cars. 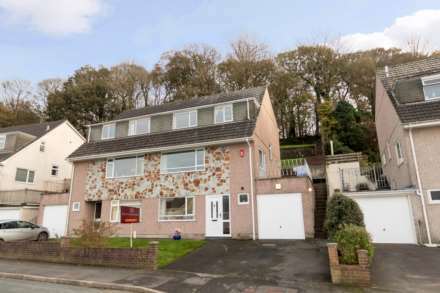 From its unassuming and modest frontage this property simply must be seen to be appreciated, and with its proximity to Derriford hospital and other local amenities we suggest an early inspection. Entry is gained via a uPVC double glazed door into the main hallway. Doors lead to the dining room, three bedrooms and the family bathroom. This heart of the home offers door tot he hallway, bedroom four and an open arch way leading to the lounge and galleried stairwell. There is ample space for a family dining table and chairs in this bright and airy room. This room alone is what sets this property apart from others in the area. Offering a triple aspect with French doors to the rear leading to a balcony with far reaching views, a great place to enjoy those late summer sunsets! The room has stairs leading down to the lower levels and being over 20` wide offers a wide range of layout options to any would be buyer. Good size double bedroom with uPVC double glazed window to the front aspect and triple mirror fronted wardrobes. uPVC double glazed windows to the front aspect. A good size room with uPVC double glazed window and door leading to the side. Fitted suite comprising low level WC, wash hand basin, bath adn full double length shower cubicle. There is a uPVC window to the side aspect. Doors leading to kitchen/diner and downstairs WC and utility room which offer a low level WC, wash hand basin and ample space for utility machines, and there is a uPVC double glazed windows to the side aspect. Open plan room with excellent access to the rear gardens. There is a modern fitted kitchen with a range of wall mounted and base units with work surfaces over incorporating a sink and drainer unit with mixer tap over and part tile surround. To the front is a large sweeping driveway with enclosed bedding plant area which is well maintained and provides great privacy to the front. The garage features a remote activated electric roller door and is of a good size with pedestrian access to the rear. To the rear of the property is an enclosed garden mostly laid to lawn but offering patio to the rear of the garage and property which extends to the side. The remainder of the garden is level, Southerly facing and offers mature bedding plant areas and is enclosed on all sides.